After a background in boxing I was looking for something different, with more of a realistic approach to self defence. I stumbled across Krav Maga which wasn’t as well know back then. 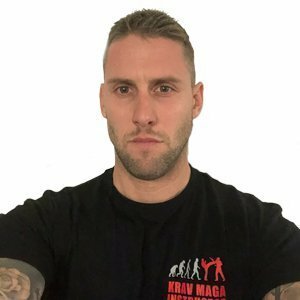 I did a quick google search thinking a club would be hours away to find one 10 mins down the road and taught by one of the best Krav Maga and combatives instructors in the world, David Stevens. Through my time training with Dave I learnt Krav Maga to the highest level and also the art of brutal combatives. I became an instructor pretty quickly after a 2 and a half years and along my journey reached the level of expert in israel. I have also crossed trained in Muay Thai and bjj. Both of those instructors that taught me are very high level guys in their field. During my training and teaching, I spent over 5 years working as a doorman in rough clubs. solely to test out and adapt what I had learnt, as I believe a high level instructor should have tried and pressure tested what they teach. I am true to my core beliefs and refuse to teach things I know don’t work in a real life situation.